From Small Repair Shop to Full Scale Computer Servicing or Support Organizations, Eurosoft Hardware Diagnostic Solutions Have the Features You Need. 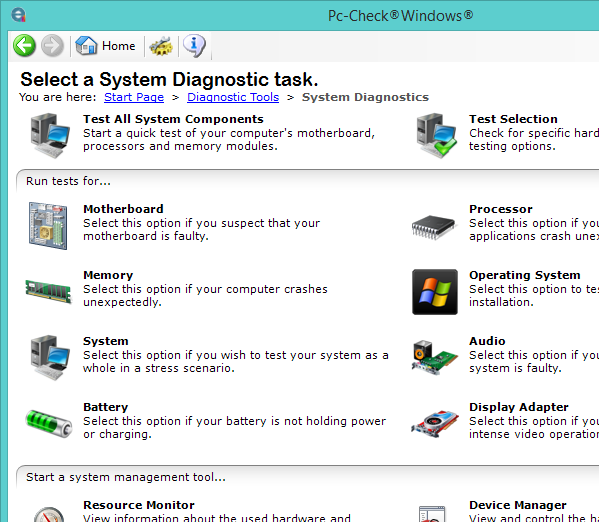 Pc-Check Windows diagnostic tools gives you a testing advantage with Windows®-based computers. Fully compatible with Windows 10, Pc-Check Windows diagnostic software ensures that components are reliably tested and validated in the environment in which they are used. Windows comfort zone, all devices explored –reliable hardware tests you can count on. Powerful and easy to use, utilize Windows®-based tests, INCLUDING WinPE to manage the continual updating of software-driven hardware. Ideal for all hardware that requires Windows drivers to function. Take full advantage of WinPE deployment. Fully test UEFI enabled components as well as non-UEFI hardware. Diagnostics work precisely with Windows to test hardware in its intended operating system environment. Highly configurable. Choose scripted or manually selected test modules. PC manufacturing, repair, refurbishment, support, sales, hobbyists, and education all require reliable computer diagnostics in order to accurately verify PC hardware. Unreliable and inaccurate diagnostics cost companies and technicians valuable time and money through inaccurate results and inefficient operation. Pc-Check Windows diagnostic tools are reliable and enhance service reliability, decrease technical support telephone calls, and improve customer satisfaction and confidence. Businesses who process PCs – building, installing, servicing — often require a valid “proof-of-failure” to be included with any component or computer system. This is the case for returns to a supplier and deliveries to consumers. In these cases, if a valid test fulfilment record is not included, the component or computer will not accepted and may incur fees or fines. PC manufacturers, servicers, refurbishers, and retailers alike not only need reliable diagnostics, they also need flexible reporting features that allow the diagnostic results and system information to be captured. Pc-Check Windows provides system information and diagnostic test results in printable reports, PDF files, and as database-friendly XML outputs. Business who process PCs are also burdened with training and staffing requirements. In order to achieve greater efficiency, diagnostic tools need to be easy to use and highly repeatable. 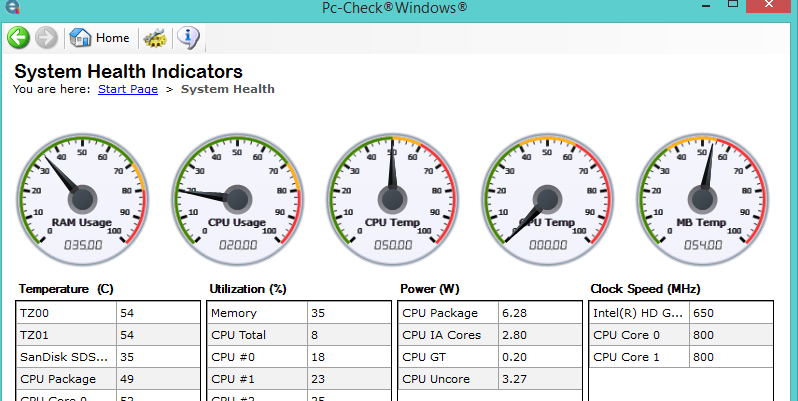 Pc-Check Windows features an easy-to-navigate interface for launching diagnostic tests on demand as well as creating and saving custom test scripts and test parameters. The layout of the Pc-Check Windows interface can be customized to your process needs and saved for continued and distributed need. Pc-Check Windows supports useful command line features such as automatically launching scripts on program start-up allowing technicians to run the same consistent testing each time they run Pc-Check Windows. And specialized customizations and error code returns allowing process engineers to use Pc-Check Windows effectively in their own automated factory processes. This flexibility provides capabilities for managing support and repair workloads, ensuring that technicians are able to identify hardware faults quickly, saving hundreds of man-hours in fault testing, and even allowing end users to test and review their own PCs. Diagnostic solutions need to be portable and deployable In order for companies to achieve the most benefits from them. 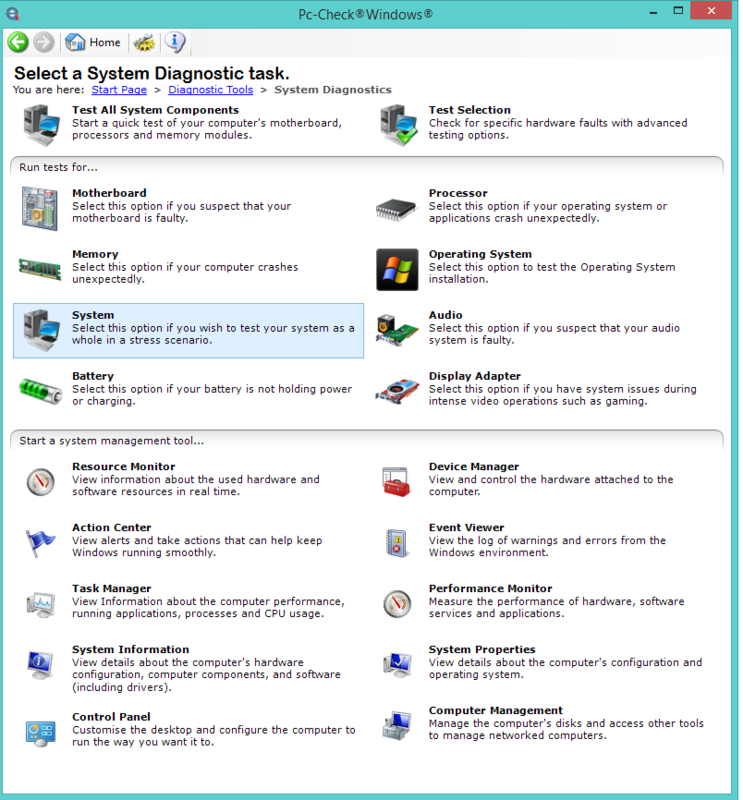 Pc-Check Windows diagnostic tools is designed to be highly portable. Pc-Check Windows Builder provides the ability to create Pc-Check Windows for portable media directly to a USB drive or as a .ISO file. Pc-Check Windows is also deployable through a connected network via WIM file creation. (Network deployment requires site license). Pc-Check Windows diagnostics support Windows XP SP3, Vista, Windows 7, Windows 8, Windows 8.1, Windows 10 and Windows Server 2003 and 2008. Almost all the diagnostics will run in Windows Preinstallation Environment (WinPE) allowing process engineers to use Pc-Check Windows on Linux, pre-loaded, or otherwise non-Windows machines. Companies who supply PCs to customers always face a certain amount of product returns. Failure to find faults when processing PCs, and failures that arise after the customer receives the PC can cause huge losses to businesses. Pc-Check Windows diagnostics reliably find faulty hardware. Pc-Check Windows diagnostic effectiveness catches failures before they leave the process thus reducing the need to process returns. Pc-Check Windows also allows PC errors and failures to be diagnosed in the field eliminating huge shipping costs induced by mailing the entire unit back. Operations that are responsible for testing and validating PC hardware require a wide range of test coverage in order to diagnose the variety of PC components. Pc-Check Windows provides over 130 different tests, conveniently accessible from 25 comprehensive test groups. Pc-Check Windows allows technicians to execute immediate testing, and create and save limitless custom test scripts for the entire operation from one easy-to-use application. Pc-Check Windows diagnostics can fully test UEFI-enabled components under Windows 8, 8.1, 10 as well as non UEFI hardware under Microsoft Windows XP (SP3) or later operating systems, Microsoft Windows 2003 & 2008 Server, Vista, Windows 7, Windows 8 and Windows 8.1. Supports Microsoft® Windows Preinstallation Environment (WinPE). Pc-Check Windows is ideal for testing in Windows, add Pc-Check and Pc-Check UEFI to expand your testing outside of Windows. Testing outside of Windows allows a more direct access to critical hardware and isolates testing from faulty device drivers, malware, and viruses. Pc-Check UEFI pre-boots directly to “native” UEFI hardware, giving you clean, pure, precise UEFI component test results you can count on – without an operating system required. Improve PC reliability, decrease technical support calls. Increase customer satisfaction and confidence. Pc-Check® is your ready-to-use-now diagnostic software for legacy systems. With its self-booting start-up, you don’t have to worry about which operating system is installed. Pc-Check only tests the hardware you want it to. 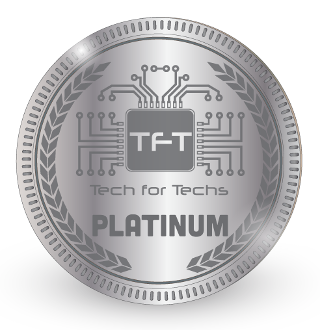 No gimmicks, no files touched, no brand names considered – just reliable hardware test results.